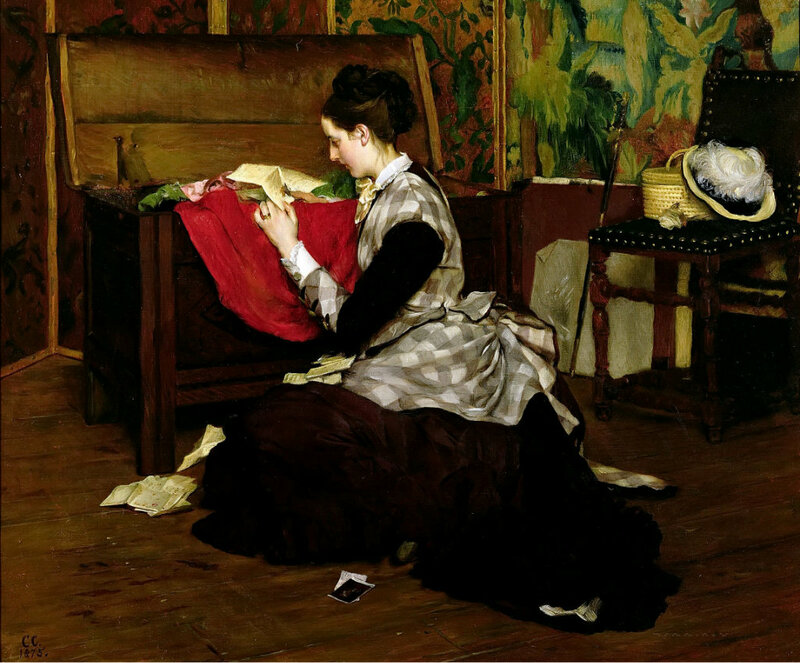 Old Letters and Dead Leaves, 1875, oil on canvas by British artist Claude Andrew Calthrop (1845–1893). Courtesy of The Athenaeum. Mrs. Blackman—a woman with the artistic temperament—woefully unballanced [sic] I am afraid. Her face is very beautiful and attractive—particularly her large dark eyes. I can understand how her husband gives offense to other women by losing himself in contemplation of his wife when in company. There seems however always an arrière-pensée [unrevealed thought] with her, which acts as a barrier between us. When she finished the story in December 1894, Chopin sent it off to The Century, which had published several of her previous submissions. By this time Chopin was a well-known and respected writer, but the story was rejected—almost surely because it dealt with a woman’s adulterous affair. The magazine’s editor, Richard Watson Gilder, “felt that fiction should be pleasant and avoid the horrifying, the indelicate, or the immoral,” as Chopin scholar Per Seyersted puts it. Undeterred by the story’s rejection, Chopin immediately forwarded it to Vogue, which routinely published her more daring stories after they had been rejected by other national magazines. Charlotte Rich, in her discussion of “Her Letters” in A Companion to the American Short Story, writes “Chopin’s works often raise questions of morality, but they do not provide definitive answers to them.” Such moral ambivalence—Chopin’s refusal to condemn her characters for their transgressions—troubled many of the country’s literary gatekeepers and would ultimately lead to her downfall when she published The Awakening, now universally regarded as her masterpiece. While reading the following story, readers familiar with the novel will notice several parallels—and a few striking differences—in the themes, lead characters, and endings of the two works. Note: On page 782, after the top paragraph, in which the husband presses his head against the batch of letters, the following paragraph appears in the version published by Vogue. “He had once seen a clairvoyant hold a letter to his forehead and purport in doing so to discover its contents. He wondered for a wild moment if such a gift, for force of wishing it, might not come to him. But he was only conscious of the smooth surface of the paper, cold against his brow, like the touch of a dead woman’s hand.” Chopin crossed out these lines on her copy of the clipping, and they are omitted from the text below. She had given orders that she wished to remain undisturbed and moreover had locked the doors of her room. . . . If you don't see the full selection below, click here (PDF) or click here (Google Docs) to read it—free!